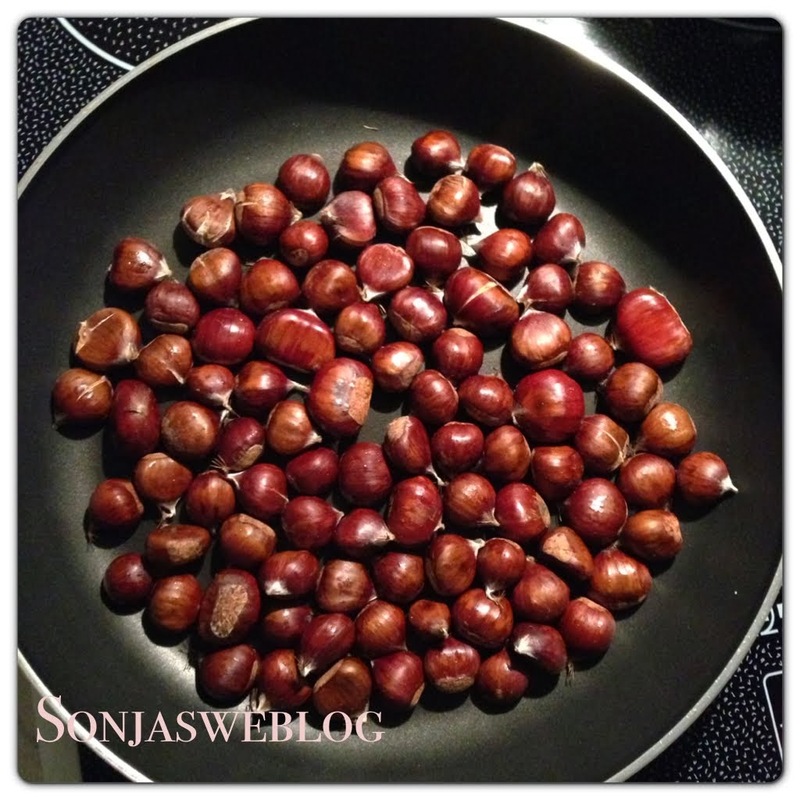 One of my favourite winter snacks are roasted chestnuts. I usually buy them from a little stall at the Christmas market where they are roasted on a charcoal grill. They come in a brown paper bag and keep your hands nice and warm. But that's still one month to go. Last week I got a huge bag of chestnuts from my mother collected in the forest. They are much smaller than the one you can buy in the supermarket and smaller than the non-edible type of chestnut. In the picture below you see the so called horse chestnut (left) and the edible sweet chestnut (right). I like the pointy end with the taft at its tip. It looks like a little pouch or teepee or fig. To roast them without grill I just used a frying pan. I cut some of them crosswise with a knife. 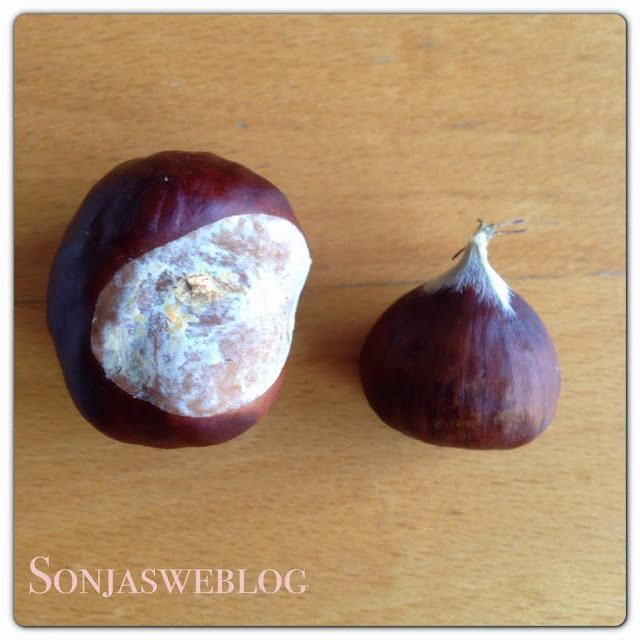 But it was difficult as these chestnuts are so small and the outer skin hard. So most of them went into the pan as they were. On full power heat without anything added, just turned around with a wooden spoon. 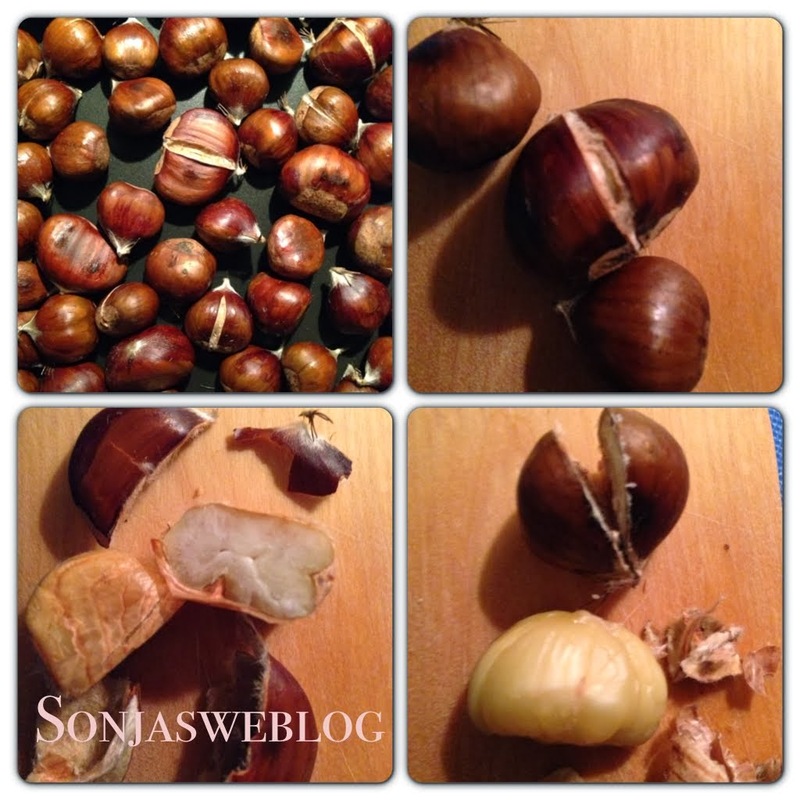 When the outer skin, the brown husk breaks open (the ones cut crosswise) the chestnuts are "done". With a sharp knife it is easy to get rid of the husk and the inner skin. Then you get to the sweet tasting creamy white fruit. The texture of the fruit reminds me of a potato, maybe because the chestnut contains a lot of starch. A great snack for the evening! Hi, we do this in Catalonia for the evening of 31st of October. Also grilled, but the the alternative is to do it in a pan like you did, also cut open. The difference however is that the pan has holes in the bottom. They get more heat and a "roasty" look, but of course only works well with a gas cooker. I haven't eaten any for a long time now. Then we serve some "Moscatell" (a very sweet Muscat-like wine) and some special pastry called "panallets". The Moscatell fits very well with the chestnuts. Very very typical. Hi Sonja! I´m here to say that I love chestnut and now I´m reading your blog. It´s very interesting and I like how you write. Also, I´m a friend from Joaninha B.